Various First Things editors contribute every now and then to an entry called "What We've Been Reading." Veery Huleatt has been reading one of Dorothy L. Sayers' mysteries: The Nine Tailors. .... Although the series as a whole is temporally and geographically defined by twentieth-century Britain, each mystery immerses the reader in a different world. An Oxford women’s college in Gaudy Night, a London advertising agency in Murder Must Advertise, and a country estate in Clouds of Witness (which also ventures into an Anarchist dive, featuring an unforgettable young Boheme who cannot keep her interminable string of beads out of the soup). The Nine Tailors all but deafens the readers with the technicalities of church bell ringing, and then drops a grisly murder. Enter Wimsey and Bunter from a providential motoring accident on a dark and stormy night, and the race is on. Impressively researched and crafted, Nine Tailors is often acclaimed as the best of Sayers’s mysteries. I don’t like to pick favorites among my darlings, but I’m willing to concede to the critics here. The full title of the book is The Nine Tailors: Changes Rung on an Old Theme in Two Short Touches and Two Full Peals. I don't think I knew anything about change ringing before I read this book. 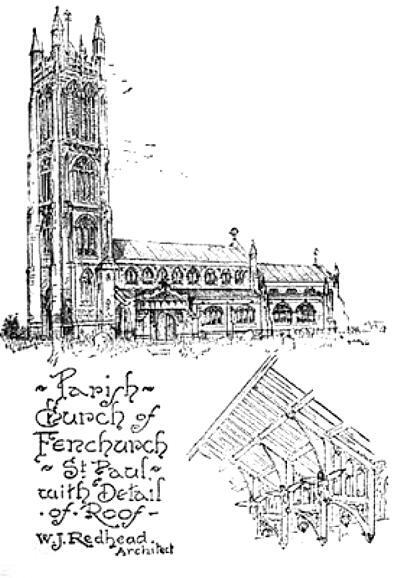 The "Nine Tailors" are bells hanging in the belfry of the "Parish Church of Fenchurch St. Paul," the church at the center of the plot. The picture is from my 1934 copy of the novel.